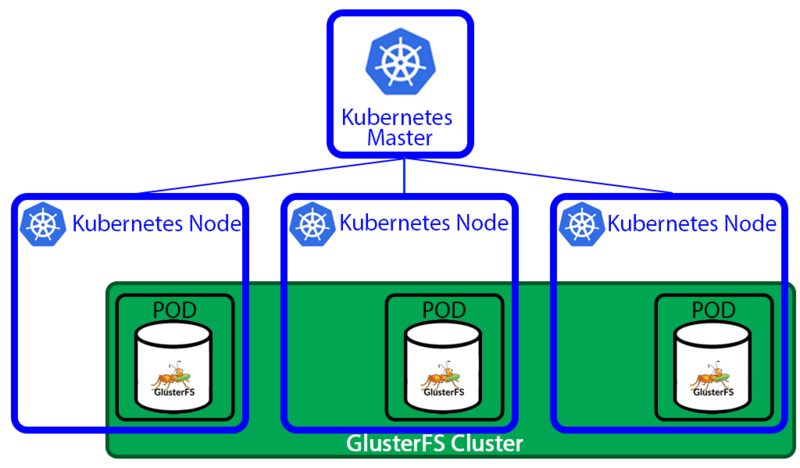 I spent last two days installing GlusterFS storage on top of my Kubernetes. It took much more time and effort than it should. I faced all kinds of problems, some if which were not obvious and took a lot of googling. So I decided to write this post. Hopefully it will save some time for somebody. I was playing with helm. Trying to assemble a complex application with several dependencies from official chart repository. I tried to install PostgreSQL chart with persistence enabled, but it didn’t work. After inspecting manifests it became clear that it needs dynamic storage provision. Since I’m running bare-metal cluster it has no proper storage solution. Everything is running NFS. So I cloned this chart and changed it to use NFS. Not the best solution but it worked. But then I tried to install Minio and faced the same problem. But in this case it it was impossible to do the same hack because of StatefullSet. I read about dynamic storage provisioning and new StorageClass entity in Kubernetes. But since I had only NFS storages I didn’t try it. After some googling, I had two choices for my storage: GlusterFS and Ceph. They were both OK for me until I found heketi . Heketi provides a RESTful management interface which can be used to manage the life cycle of GlusterFS volumes. With Heketi, cloud services like OpenStack Manila, Kubernetes, and OpenShift can dynamically provision GlusterFS volumes with any of the supported durability types. Heketi will automatically determine the location for bricks across the cluster, making sure to place bricks and its replicas across different failure domains. Heketi also supports any number of GlusterFS clusters, allowing cloud services to provide network file storage without being limited to a single GlusterFS cluster. So I decided to go with GlusterFS. Heketi even has the guide on Kubernetes integration. I will go through the guide here with all the problems and solutions/hacks I had to do to make it work. At this point, we have 2 GlusterFS pods and heketi deployer running. Here is a cut of my topology file. After the first run, I’ve got this error. This actually was my fault. I missed the NOTE in the documentation and put IP address instead of the hostname in hostnames.manage field. NOTE: Make sure that hostnames/manage points to the exact name as shown under kubectl get nodes, and hostnames/storage is the IP address of the storage network. Next time I run the command it hanged. I tried to restart the command and all pods. I tried to change the order of nodes in topology file hoping that it was some buggy node. Nothing. I tried waiting 10-15 minutes to get timeout and error as was suggested in some thread. Nothing. Finally, after some test and trial, I found a workaround. It’s definitely not a solution, but at least it worked. Workaround/Solution: attach to all GlusterFS pods and run pvcreate manually. After I got it to work I tried to delete everything and run from scratch, but it hanged the same way. And again running pvcreate manually fixed the issue. Anyway, after this heketi-cli topology load --json=topology-sample.json successfully created my topology. Next step was to run heketi-cli setup-openshift-heketi-storage . Which should provision a volume for heketi’s database. The name of the command is a bit confusing. I spent some time searching to make sure that I need to run on non-openshift platform. But it should be run. As you may guess, it also didn’t go smooth. Apparently, this command has default replication factor of 3 and it cannot be changed. Workaround/Solution: add 3rd node to cluster. thin: Required device-mapper target(s) not detected in your kernel. Run `lvcreate --help' for more information. Quick googling lead me to this issue. Workaround/Solution: To fix this we need to run modprobe dm_thin_pool on all nodes. I had one more issue, but it was due to a misconfiguration in my DNS server. Workaround/Solution: Make sure that all GlusterFS pods can resolve and ping each other. The previous command produced a file called heketi-storage.json . Now we need to deploy it to Kubernetes and wait until the job is finished. After several minutes I noticed that container stuck in ContainerCreating state. In pod description, we can see that it can’t mount glusterfs filesystem. This error was fixed by installing glusterfs-client on all nodes and restarting the job. After the job is completed we need to delete everything used for bootstrap and deploy actual heketi. # wait for job status "Completed"
> $ kubectl delete all,service,jobs,deployment,secret --selector="deploy-heketi"
Finally, we can create PVC to test that everything works. After two days of struggle, I finally got it working. It was definitely worth it. I already tried to use it to create dynamic volumes for different helm charts and it works pretty well. Now I can forget about manual creating of PersistentVolumes. With this features bare-metal cluster became closer to cloud-based ones, at least storage-wise.